Second entry in the Matrix trilogy details Neo's efforts to aid human resistance against the Matrix. First sequel to The Matrix (1999). 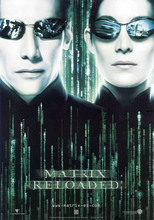 Six months following the cataclysmic events of The Matrix, computer hacker-turned-Messianic figure Neo operates from Zion, the Resistance's last remaining fortress of stability against the scourge that is the Matrix. Discovering his powers of super speed, superior reflexes, and a measure of precognition just in time for grim news of a quarter of a million machine sentinels expected to arrive to decimate Zion in just three days' time, Neo must work quickly alongside Morpheus and Trinity to harness his abilities for humanity's last great defensive whilst eluding a newly-rejuvenated Agent Smith.